We live in a world of trends and fades. A world where, if one idea works everyone tries to capitalize on that success. Recently in the world of theater and opera, two trends have risen from the mix. First, fusing sports and theater and second, fusing pop culture icons and opera. In La Mama and Monk Parrot’s latest work, they place a pop culture icon from the sports world and tell his story through opera. Bum Phillips All-American Opera shares the tale of legendary Houston Oilers couch, Bum Phillips on his journey and desire to take his team to, and ultimately win, the Super Bowl. For those who can’t place just exactly who this man is, Bum Phillips, a Stetson-wearing Texas native, coached the Houston Oilers from 1975 until 1980. Bum Phillips All-American Opera chronicles bits or his early life and the majority of his time in Houston as head coach of the Oilers from ’75 to ’80. Surrounded by big dreams and big personalities, Bum was able to gain great success for his team and city, even earning the “Luv Ya Blue” chant, but ultimately failing to win the big prize, the Super Bowl. Though there were some additional colorful characters propelling Bum, the opera weaves in and out of fun and drama to tell Bum’s trials and tribulations. But for an outsider who doesn’t know Bum’s highlight reel, opera may not have been the right medium for this story. Opera, in general, has a heightened state. The art itself lives in it’s own world where the stories are acceptably told completely and entirely through song. Its history is rich in drama and romance and elegance and splendor. So when you take an opera and give it flash, panache, glitz, and glamor, especially with recognizability, it comes off as funny and kitschy. The Bum Phillips story is not necessarily funny. Though he may be a larger than life personality, sharing his tale through opera may not have been the best medium. In regards to pop culture icons getting the opera treatment, Jerry Spring and Anna Nicole Smith found themselves in funny, larger than life predicaments that worked in an opera setting. Sure, there were dramatics, but the over-the-topness lends for the drama to land. You were allowed to laugh at them. In what was presented in Bum’s story, there were no peaks and valleys, it was, for the most part level like the Texas setting he lived in. In a piece that was borderline camp, I wasn’t sure if I wanted to laugh at the material or the story. The libretto by Kirk Lynn was filled with “Bumisms” that lacked the impact of importance when accompanied by music. Of course, there were moments in Bum Phillips that were gold. Jessie Dean, Briana Elyse Hunter, and Victor Khodadad as the ABC announcing team-slash Greek chorus of sorts, were a source of high entertainment and talent. Dean and Hunter especially had beautiful voices and their articulated facial expressions allowed for some shinning moments. Patrick Mulryan, who for the most part remained in the chorus, shined in his Act II role of Mike Barber. Mulryan conveyed beautiful emotion through his solo. Unfortunately, though, Gary Ramsey as the title character lacked lead role credibility. Perhaps it’s the character he portrayed, but Ramsey did not leave a memorable performance despite quite a unique singing voice. As far as the design of the opera is concerned, everything was big and flashy, like the state it took place in. 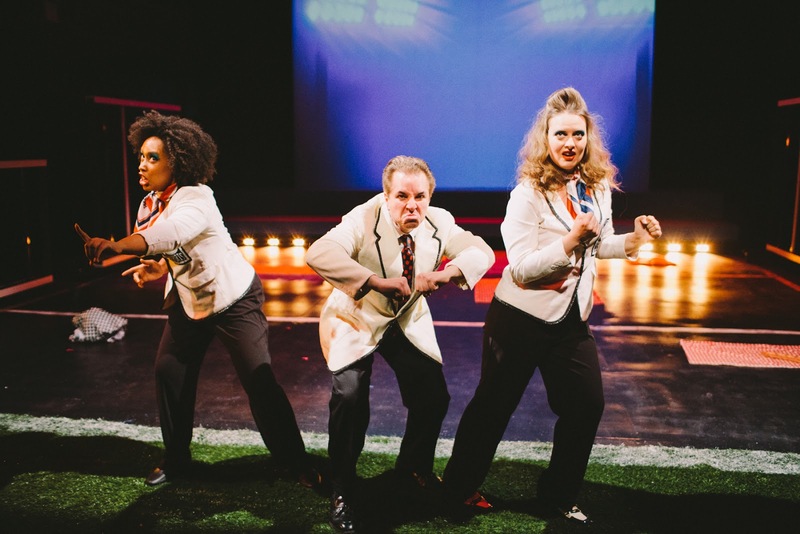 Scenic designer Marie Yokoyama transformed the cavernous Ellen Stewart Theater and miraculously created an intimate yet large environment inspired by a football field, though I wished there was more artificial turf covering the stage. The projection design by Trey Gilmore brought the opera new life, but occasionally came off as hokey and too distracting against the musical staging. Director and conceiver Luke Leonard’s bold decision of Bum Phillips All-American Opera was an honorable undertaking that just didn’t score. Maybe for Bum loyalists, this is a can’t miss, but after reading the director’s note, what was written on paper was just not executed on the stage.